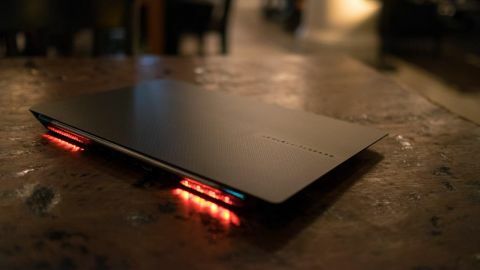 Mid level specs with high-end style, the HP Omen is a fantastic gaming laptop that sets a high bar with a unique design and excellent performance. Late last year, HP turned plenty of heads announcing a gaming laptop when the company was better known for its affordable, consumer mobile computing systems. The introduction of the original Omen not only came as a surprise, but a genuinely pleasing one at that, as a gaming laptop sporting with more than decent parts and a unique design. Now with a new line of Maxwell graphics cards out in the wild, the HP Omen has seen one of the industry's quickest refreshes – less than half a year. On top of packing a new Nvidia GTX 960M GPU, the HP Omen's processor has been given a slight bump up to Intel's Core i7-4720HQ chip. All together, these small upgrades freshen up the already excellent HP Omen and help it keep up with the latest crop of gaming notebooks, like the Asus ROG G501 and Gigabyte P35K v3. The HP Omen has a unique look unto its own, thanks to an eye catching and bold design. Rather than following the traditional rectangular shape of most other laptops, the HP has a decidedly more dramatic, trapezoidal profile with some steeply beveled sides. The tapered sides and small footprint give this laptop a sharp and unique look, which also helps to make it feel thinner than it actually is. However, going with such a bold design also has its drawbacks. Because the sides of the laptop are angled so steeply, there's isn't room for any ports save for an SD card slot on the right-hand side. The rest of the ports (including four USB 3.0 ports, HDMI, mini DisplayPort, and a headphone/microphone combo jack) have all been moved to the rear. This placement makes sense to hide away cables, if you have your machine plugged into a monitor and other peripherals. But it's also an annoyance when plugging in something as simple as a pair of headphones. Aside from the wedged-shaped box design, the Omen also has some neat surface details. The top lid, for example, is adorned with a pattern of alternating triangles etched into the machine's aluminum exterior. It's an attractive touch that makes the Omen look all the more futuristic. This design cue extends to the underside of the laptop, where you'll find larger cutouts for the ventilation. There's also a grated finish on the bottom of the notebook closer to the front edge, which helps add an extra bit of texture to grip on to as you carry it around. Here you'll also notice the laptop sits on top of a rubber ring that basically loops around the entire perimeter of the machine. Usually rubber feet help to prevent the underside of the notebook from scratching against any table tops while keeping it firmly in place. But, because of the arrangement of this rubber ring, it also acts like a giant gasket, sealing off ventilation from the sides while leaving only two gaps at the front and back of the laptop. Luckily, gaming proved to be no issue despite the choked intakes on the bottom of the laptop. In the future, though, a more segmented rubber ring would help to keep the laptop cool and potentially pave the way for more powerful GPUs should heat issues arise. Flipping open the screen reveals an attractive, glass-fronted display accented with a Hewlett Packard logo in simple and sharp typography. Along the sides of the machine, you'll find a pair of speaker grills that practically span the entire keyboard deck before transitioning into a pair of red lighting strips. Speaking of illumination, the keyboard is also a fully backlit affair, which users can fully customize with the accompanying HP Omen application. Like some multi-colored keyboards I've seen on Alienware and Origin machines, the whole grouping of keys separates into four distinct lighting zones that you can customize with a full rainbow of different colors. You can even set a distinctive hue for the WASD keys. The lighting zone's even extend to the laptop's rear exhaust ports, which seem to only activate when you have the machine plugged in. Towards the back of the machine, you might also notice the hinge is tinted blue at the far edges. It's an interesting, albeit completely unnecessary, design touch that's made to resemble a hotrod's titanium tailpipes and evokes the fantasy of flames shooting out of the rear vents. Meanwhile, the lighting bars beneath the speakers have an extra feature: they react to the tune of your music, flashing whenever the octaves reach a certain threshold. It's a nice feature on paper, but in actuality, I find that I have to really pump up the sound before these speaker-bound lighting strips start pulsing to the beat. Another annoyance I have with the Omen's lighting zones is the LEDs are simply not bright enough. In a well lit room, the backlit keys look like they've been only slightly tinted with color even though I've set the backlight to 100%. As a result, you'll pretty much have to use the 15.6-inch gaming rig in total darkness to appreciate your multi-colored setup.